You can be vulnerable AND strong. You can be quiet AND fierce. You don’t have to be one or the other. As an introvert, you are meant to lead in your own way. 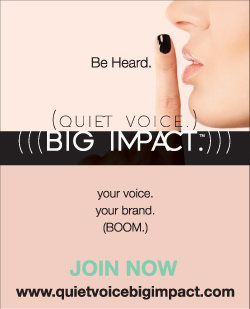 Hope you enjoyed the first interview with Jaleh in my “Quiet Voice Big Impact” interview series where I am featuring different inspiring quiet leaders who are making a big impact with their voices and meaningful brands. Next up is Shavonne Broom, the creator StyleChurch. Through her powerful movement, she loves spreading the message of self-acceptance and self-expression through style. She is a powerful speaker and soul-driven fashion stylist. Shavonne embodies what it means to be a gentle warrior. Quiet and undeniably fierce. Would love to know what’s one take-away that you receive from Shavonne’s interview. Please share your comments below.